But You Don’t Look Sick is a comment I heard so many times while going through breast cancer treatment. The thing is, I was sick! Even when the chemo is over, and your​ hair grows back, there are more treatments! So let's talk about what living after a breast cancer diagnosis looks like! Episode 19 marks the end of Season 1. I am so happy to have New York Times Bestselling Author, Angelique L'Amour on the podcast. A breast cancer survivor and mother, she turned her experience into a helpful guide for other parents battling cancer with her book Chemo Cupcakes and Carpools. She also has a blog that documents her breast cancer journey, and she is here to share her insights, positivity, and humor. In the beginning of your diagnosis you may feel like you see your doctor's more than you see your family! Being able to have open communication with them, all of them, is so important. In this episode I talk about how to create a relationship with your team of doctors that allows you to have your needs met above all else. Your mental clarity about the situation is just as important as your overall physical health! January 8th will always be a day to celebrate from now on in my life. It is the day that I finished my 6th round of TCHP. The day I finished chemo and got to ring that bell. But no one really tells you how to live life after treatment. How to manage the anxiety that comes with not being monitored by your doctor's on a weekly basis. This is how I feel one year later. Happy New year! For my first podcast of 2019 I wanted to jump off with how to find creative outlets during cancer treatment. I truly feel like this is so important, to be able to channel your energy into something else and have things to look forward to and occupy your mind. In the episode I talk about using my blog as a way to document my cancer treatment and connect with other women. Also how journaling helped me to start this podcast, my styling business, and a clean beauty store Paris Laundry. Episode 15-Managing your thoughts and feelings with breast cancer and the holidays. The holidays, a time to celebrate, spend time with family, make memories, and soak in those traditions. But what if you are getting chemo during the holiday season? What if you just had surgery and cannot physically move your arms in the direction of wrapping paper? The holidays can be overwhelming and stressful, but that is life with cancer every day so how do you mix the two? Here is my advice. This episode I share my experience with starting hormone therapy. The fact that I really didn't know too much hormone therapy, the drugs, what they did, how long I would be on them, and the frequency. So much is out of your control, from the mood swings to the bone pain, and just your mental state of trying to hold it all together. So here is a glimpse into the crazy world of hormones! Episode 13- A solo fighter, Emily comes on to share her story! This episode fellow breast cancer fighter, Emily comes on to share her story. It is amazing to hear how she tackled her diagnosis. She contacted me on Instagram and told me that she appreciated the But You Don't Look Sick podcast but that she couldn't​ relate to having a caregiver there all the time, to have a husband there for support, or even a partner in general. I wanted her to come on the podcast to further that conversation. This episode I go all in with the details of radiation. Things I did to prep my skin, products I used, and what it is like to go through treatment. I also talk about going in for my exchange surgery, that ended up happening a lot sooner than I anticipated. How I choose my implant size, and what my next steps in treatment looked like. Finally, it was time for the big surgery, my bilateral mastectomy. In this episode, I am talking about the preparation for surgery, the ins and, outs of surgery itself, and recovery. I also go into detail about the next steps after there was residue disease found in my lymph nodes. This is a tough episode! Going back to the months leading up to my double mastectomy. I knew from the moment I had my first biopsy that if it was cancer, I wanted a bilateral mastectomy. I didn't know all the ins and outs of the surgery, but I knew in my heart that this was the right choice for me mentally. Reliving those months is hard, it brings up emotions I didn't have then but am realizing now. There is nothing easy about this surgery, not everyone around you will understand what is going on. What matters most if how you feel, how I felt, and how to feel confident in that. In this episode, I am talking about my last three rounds of chemo. Just when I thought I had experienced the worst of my side effects, I was thrown for a loop. I feel like my last three rounds of chemo really tested me mentally and physically. As a family, we really had to rally together and make it to the end of chemo treatments without possibly losing our minds. Episode 8 features guest Kim Angell, a breast cancer warrior. I first found Kim's blog when I was newly diagnosed and searching for women my age fighting breast cancer. I quickly followed her on Instagram, and have connected with her on so many levels. She is incredibly open and raw with her emotions, she has been through so much throughout her cancer journey and I am so happy she is here to spread the support and knowledge to the breast cancer community! Also talking about the new Breast Cancer Healthline app, designed for survivors to connect with one another, provide resources, and have live discussions. Inflammatory Breast Cancer, have you heard of it? Do you know what to look for? I had never heard of IBC in the grand scheme of getting diagnosed. I met Lindsey and she shared her story with me and I realized how much I didn't know about IBC. I figured if I didn't know even as a newly diagnosed cancer patient, how many others had never heard of this form of breast cancer? Lindsey talks about symptoms, treatments, and her experience. Kicking off breast cancer awareness month with real women behind the color pink! Rach DiMare from the blog RD'S Obsessions shares her journey from being diagnosed to life after treatment. Rach is one of the first women I connected with after my diagnosis, and she has been so helpful and supportive along the way. I am so happy that she is here to share her insight! Episode 5-Getting rid of the negative to make room for the positive. The first couple of months of treatment were a slightly dark time for me. I didn't know how to feel about my physical changes, I didn't know how to act, and I didn't know how to process everything that was going on. What I did know was that I didn't need any added stress from people in my life. I needed to rid my life of the negative weight, in order to see things more positive. This episode takes you through some of that, and how to feel okay about putting yourself first! This episode really dives into the need for help throughout cancer treatment, not just physically but mentally. I had such a hard time asking for help, and then there was guilt associated with accepting help. I learned so many things going through this process that I wanted to share my thoughts​, looking back. This episode I wanted to bring in my husband as he was a huge part of my cancer treatment. He was my caregiver day in and day out. Caregivers are not talked about or given the support that they need, in my opinion, so Chris is here to give some advice and insight into his experience since my diagnosis. This episode I detail that first meeting with my oncologist before starting chemotherapy, the advice he gave me, and my initial feelings. I will also talk about that first round of chemo and how my body reacted to it, along with how we told our children, and having to shave my head. It is a lot to take in! The first official episode of, But You Don't Look Sick! This episode is also launching exactly one year after I was diagnosed with breast cancer. This episode tells you how I found my lump, the months it took me to be diagnosed, and the feelings I had hearing that I had cancer. 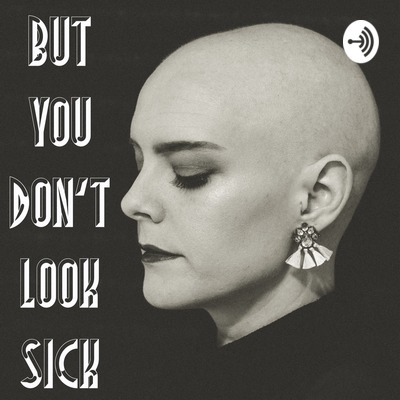 But You Don't Look Sick is a podcast about breast cancer, or rather the mindset behind beating cancer. The lowest lows, yet the high highs that come with fighting cancer. You will hear from Kelsey herself, caregivers, thrivers and survivors, and many others impacted by cancer.